My AirBnB hosts, Fritz and Anna, are a kind and thoughtful couple, hippy hipsters, who despite being slightly shy over their passable English, cheerfully answer my questions about their beloved city each morning over breakfast, which they've generously included in my stay. Anna grew up in on the East German side of the Berlin Wall, a proverbial world away from the West. This morning she shares with me some of her memories. As with all Communist countries, unless you came from the political elite, little opportunity existed. The government's primary goal was control, control, control. Freedom of speech, of movement, and of choice, were almost non-existent. If the Deutsche Democratic Republic (DDR) desired a more working class oriented society, even if you were an outstanding student from an educated family, it was nearly impossible for you to pursue your studies further. Even children had to be careful of what they said. Always interested in environmental issues, Anna drafted a note to the politicians complaining that all the fish were lying upside down on the river's surface, poisoned by the chemicals dropped into the water by the local factory. When she presented her letter to her parents, she was told in no uncertain terms, "absolutely not!" Imagine how stern and pointed the German must have been in the more rigid East. Not only could she never send the report to the local officials, she was warned not to even breathe a word of it to anyone or there would be serious repercussions at home. And they not only meant for Anna; her parents rightfully feared being sent to prison. That means this environmental disaster never took place. No one reported it, no one spoke of it, a blind eye was turned, and it certainly wouldn't appear in any Communistic history book. How will such a society fare compared to one in which freedom of speech is a protected right? Which is more likely to have an ever growing cancer causing cesspool? Not that we'd ever about it. The incumbent government was re-elected with a staggering 100% of the vote each election! You might think to yourself, "They must have been incredibly efficient, forthright, and managed the economy exceptionally well." Maybe. Or perhaps it's that they were the only party on the ballot. Yet despite political experts from both East and West predicting "landslide victories," and nearly "insurmountable odds" for the non-existent opposition party, voter participation was almost 100%. Constituents who thought their time would be better spent staying home on election day and watching the last vestiges of paint on their walls slowly disintegrate were soon visited by concerned government minders who asked ever politely, "What happened? ... It's okay, we brought the voting box to you." "Still don't want to vote? ... I think your shack a bit more comfortable than an East German jail cell." Limited, scarce, and of poor quality, perhaps with the exception of the pride of East German manufacturing, the famed "Trabant,"the DDR's answer to the VW Beetle. So exceptional was the original engineering, the motivated engineers found "no need to change a thing." The first auto off the assembly line looked and performed nearly identically to cars when production was finally halted in 1989. 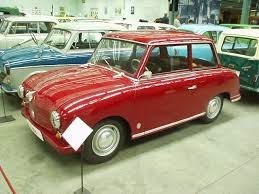 The Trabant had a two-stroke pollution spewing engine which maxed out at an earth-rumbling 18 horsepower. Although they cut corners on safety features such break-lights, turn signals, and sometimes part of the auto-floor, no one seemed to mind, considering the car was rarely operational. But in a collective society, the Trabant was available to anybody. Yes, that's the benefit of Communism, the equality of it all. Just sign here ... and wait 15 years. Anna, who was in her teens when the wall fell, describes the aftermath. "No one could believe how rapidly change took place. Our mood quickly crescendoed, excitement mixed with fear of the unknown. The biggest and most immediate change were all the consumer goods that flooded into the stores. Never before had people in the Eastern Bloc countries seen so many choices. Inefficient factories which had operated in East Germany were closed, for the first time ever in this Communist society, some people were out of work. Many East Germans were ill equipped to work and hold jobs in the West. The German government found itself paying for the schooling of the people of East Germany." The DDR is still in the process of being absorbed by the West, and Berlin still is not on equal footing as other German cities, a fact which manifests (a positive for visiting Berlin) in prices for food, rent, and wages being lower. However, due to a concerted government effort, existing infrastructure, and economic support offered by West Germany, the Hangover of Communism suffered by the DDR has been far more mild than the other former Eastern Bloc countries. Tumultuous change is the 20th century through-line of Berlin's history. From being built up by Hitler, then bombed into rubble during WWII, annexed by the Russians, to the fall of the Berlin Wall, the city's heart simply beats to a different rhythm than anywhere else. With all the culture, monuments, and history, Berlin is an absolute must see city, and if a taxi driver driving a Trabant offers you ride, by all means take it. You'll have a great story to tell your friends, especially as you propel the car forward with your feet through the non-existent floor, much like Fred Flinstone did back in the day. Except his car was technologically superior to the Trabant. Thank you for sharing valuable information. Liked it and would love to hear from you again!